The recipes section contains over one hundred delicious, easy to prepare dishes that are organized into enticing categories like, “How to Pimp a Salad” and “Cheats of Champions”. The Paleo Primer also offers preparations suitable for busy weekdays, and others for relaxing weekends. 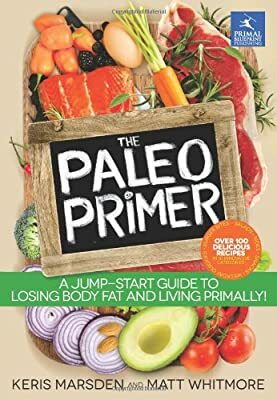 The Paleo Primer was written by Keris Marsden and Matt Whitmore, a British couple who operate a unique and extremely popular fitness and wellness facility called Fitter London. Their vast knowledge base, deft teamwork, and highly refined sense of humor shine through in these pages. It is a truly entertaining and deeply impactful read–a great gift idea to introduce a family member, friend, or loved one to Primal/paleo living. 1. There are tons of Paleo/health related books currently on the market. What was it about the subject you chose to write about in your book that made you feel so passionate about spreading the word and getting your book published? Our mission was simple, to get as many people as possible cooking their own food and more importantly enjoying it. 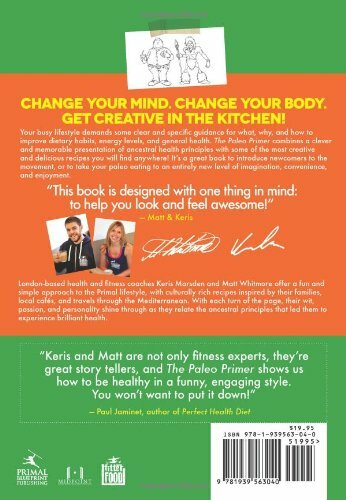 We knew our book was no revolution in the world of Paleo eating but something we felt was missing was a simple, light-hearted approach to nutrition and health based on great tasting food. 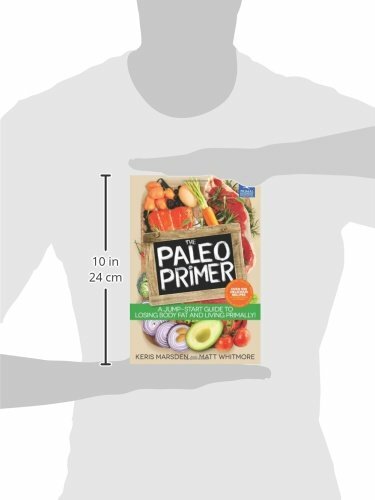 Paleo Primer was initially intended as a recipe booklet for our clients and Fitter London members. We wanted to provide some inspiration in the kitchen and some solutions to common health and nutrition issues we observed day to day. One page led to another and soon we realised we had created over 100 recipes and written 100 pages of nutrition advice. At that point we decided to bite the bullet and publish the information in a book. 2. What is it in particular about your book that makes it such an essential must-have to anyone who is interested in eating Primally and/or improving their health? The simplicity in our approach makes this book so essential, both in terms of the presentation of the information and the actual recipes (minimal ingredients and culinary skills needed). In our experience people seemed to be a little overwhelmed with all the conflicting advice regarding nutrition and also struggling to process some of the more advanced arguments provided, especially when regarding the science. Furthermore, those that could understand the case for Primal or Paleo nutrition were still struggling on a practical level and how to implement the principles encouraged. We believe in KISS (Keep It Simple Stupid) to help people take on board the important messages and some simple steps and recipes that allow them to start putting things into practise immediately. Knowledge is power and if you understand the necessity for something you invest more time and energy in achieving it. The awesome recipes! We are passionate about good food and love cooking, so creating new recipes was the exciting part. We have taken what are traditionally unhealthy meals and made them incredibly nutritious without sacrificing on the taste. There was also a lot of trial and error involved and when we finally nailed a dish and managed a great photo it was a real high five moment! 4. What is the main problem that the subject of your book tackles (for example: my book is concerned with poor eating habits, cultural eating habits, personal exercise regimes, etc.)? A: The fact that today people lead hectic, busy lifestyles and everyone is time poor. The result of this is that everyone is always looking for convenience and short cuts, health in particular seems to be taking a back seat and suffering as a result. People now rely on 'fake' processed foods and also we've lost many traditional means of preparing and consuming foods, which have also impacted significantly upon our digestive wellbeing. Having worked with clients for years we observed all the barriers they experienced when trying to get healthy and address these in Paleo Primer. We were adamant our book would be fool proof in this respect and something everyone could implement daily. In Paleo Primer we emphasise the need to see food as medicine and the importance of investing in both sourcing and preparing your own food. We devoted a whole chapter to 'Meals in Minutes' that are a healthy equivalent to ready meals, to help keep people on track when really pushed for time. We address how people eat foods and discourage rushing meals and eating in front of the TV. We recommend batch cooking to minimize your time in the kitchen, for example, cooking extra dinner so that it can be eaten for lunch the following day. For special occasions or when you may have more time there are more creative, indulgent recipes in the Paleo Comfort Foods section so you don't miss your favourite meals at all. Whether you have 5 minutes or 30 minutes we have a recipe for you! Eating good quality, nutritious food is easier and tastier than you realise. Living a healthy life and feeling awesome just requires a little structure and know how. Our health is our life force and should always be top priority; Paleo Primer is a guide to making healthy easy. We both learnt that anything is possible! We put the book together alongside our full time work running our own business and at times it was exhausting, however, our passion to change lives and help others really kept us charging towards our unrealistic deadline. Our families and friends were incredibly supportive in helping to create the book. Proofing and testing recipes, providing feedback and just propping us up when we needed. We feel indebted to them as we would be lost without them and doubt the book would even exist. Also the response from the industry we work in has been overwhelming.